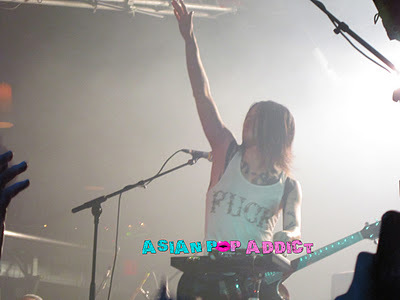 Asian Pop Addict: [BLOG] BOOM HAH HAH! BOOM HAH! [BLOG] BOOM HAH HAH! BOOM HAH! Hope that life, work, school and family are doing well. Anyways, I can’t believe that its already been more than a week since our trip to Orlando and I wish I were still there. I can honestly say that I had a really good time away from South Florida and WORK. Even if it was just for the weekend, it felt good to get away from the usual mess you deal with on a daily basis and see something new. I’m actually glad that I pushed myself to go see Miyavi. I find it funny that I enjoyed this performance while last year during his Atlanta visit I was just okay with it. Thank god I got into JROCK when I did! I was jammin! I know that might not seem like such a big deal but to those who know me, you all know that I’m not with the crowd participation. Anyways, Miyavi had so much energy on stage and the way he interacts with the crowd showed how grateful he was to the fans for their support. His English was honestly adorable although at times it was a little difficult to understand but who cares! I loved meeting a few of the APOPAddicts at the show who turned out to be such cool people. Thanks to Ani Ceris for hanging out with us! Girl, I’m hoping Miyavi goes back to Japan and tells his PSC boys to come on over. (You know I’m talking about The GazettE). Orlando was pretty, a bit of that Southern hospitality feel to it with the moss hanging off the trees and the big verandas...‘There will be a barbecue at 12 Oaks tonight’. Ana would have loved it! Overall it was a nice weekend and I’m glad I got to share it with Cynth and DoriChan. So glad you had a chance to take a break and see it. You're working hard lady! Miyavi's concert was pretty Hype, even my friends who are a bit conserved were dancing and getting into it too, so you were not alone! And you are always welcome in Orlando if you want me to keep you posted of any cool happenings I'll let you all know with time. P.S. I know the VKei addict group is super active, you can change the settings to filter the frequency you get notices. But its a great big family.